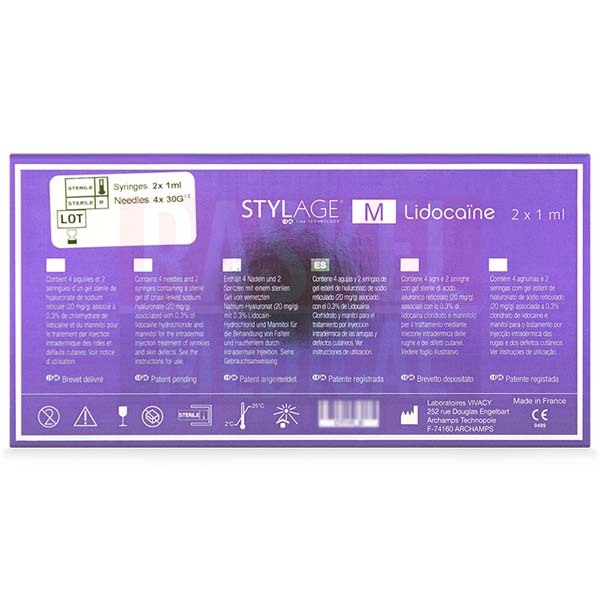 Buy Stylage M with Lidocaine Online | Low Cost Today! What is Stylage M with Lidocaine? Made from cross-linked hyaluronic acid, this formula is powerful enough to correct deep-set lines on the face, yet delicate enough for sensitive skin. Additionally, this injectable is made with lidocaine, a numbing element that lessens the amount of pain and discomfort your patients feel during treatment. This dermal treatment helps mature skin to regain its youthful appearance by reducing wrinkles and reshaping key areas of the face. Additionally, the hyaluronic acid in this formula is able to resist premature degradation in the skin due to its use of Vivacy’s patented IPN-like Technology. This allows patients to enjoy their desired results for longer periods of time. This is further boosted by the inclusion of mannitol, an antioxidant that helps hyaluronic acid to resist breaking down. Due to its density, this cosmetic injectable can be used to reshape facial features, such as the nose and cheeks. It may also be used to correct nasolabial folds, cheek wrinkles, and marionette lines. Stylage is produced by Laboratories Vivacy. This filler is produced in Europe. When can Stylage M w/ Lidocaine cause side effects? With mannitol as an active ingredient, the risk of side effects from this aesthetic filler is notably reduced. However, there are some common side effects that might appear following the procedure, including pain, redness, itching, and swelling near the injection site. These symptoms are mild in nature, and only last for 1 week or less. With this injectable dermal filler, you will find an informative package leaflet that outlines other side effects, precautions, and contraindications to be aware of before use. Review each possible side effect with your patient prior to conducting the injection. Which skin type is Stylage M w/ Lidocaine good for? Dry, dehydrated, and mature skin will benefit from this treatment, as it replenishes the skin’s moisture and volume. This will smooth out wrinkles, while also volumizing saggy, sallow parts of the face. Sensitive skin types may opt for Stylage M w/ Lidocaine over other fillers due to its anesthetic component. 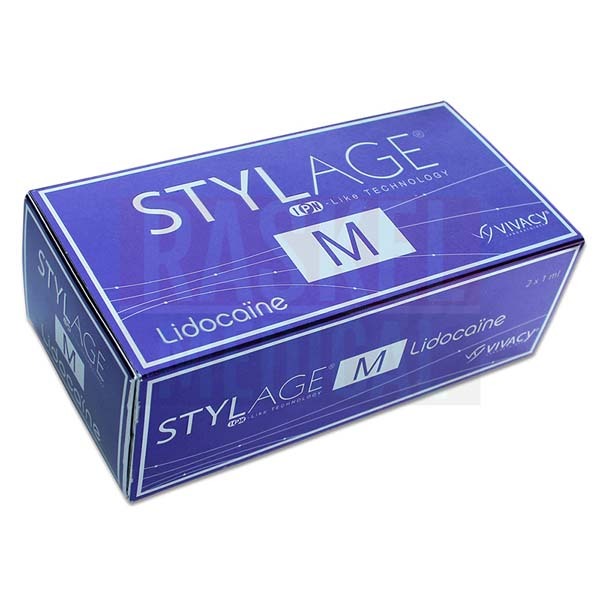 What is Stylage M w/ Lidocaine made without? This facial filler is vegan, as it is made without animal-sourced hyaluronic acid. It is also clear in colour and odorless, and is made without synthetic colours, dyes, and fragrances. Each used, pre-filled syringe and needle should be disposed of immediately after use. Please note that these components have been completely sterilized using moist heat autoclaving prior to packaging. Medical professionals have tested this product for safety, longevity, and efficacy. What is the difference between Stylage M w/ Lidocaine, Stylage Special Lips, and Stylage XL? 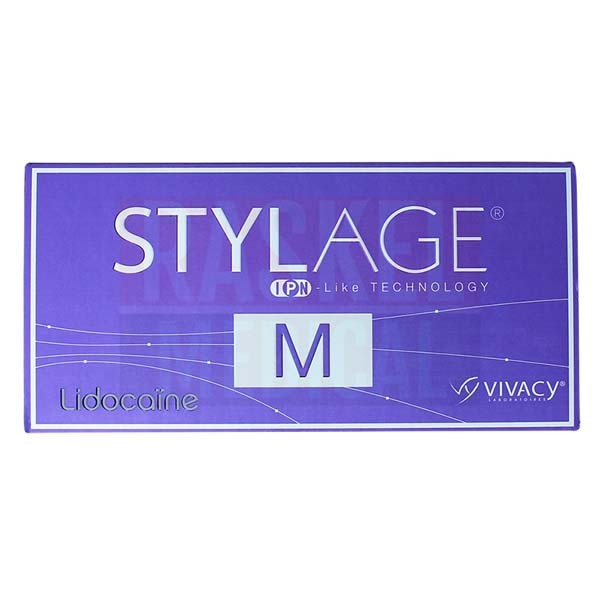 Stylage M w/ Lidocaine a number of purposes, including wrinkle correction and facial sculpting. Stylage Special Lips is intended for lip enhancement only, and Stylage XL is intended for creating a significant increase in volume. Disinfect the area where you will be applying the sterile needle. Although a topical numbing agent is not necessary, given the presence of lidocaine, ask your patients whether they require an additional anesthetic. Place the sterile needle and the pre-filled syringe together using the Luer-lock attachment. Inject the sterile needle into the mid-deep dermal layer for correcting facial wrinkles. Gently massage the formula into place, focusing on evenly distributing the complex of ingredients evenly within the skin to attain the desired results. After treatment, clean up your station, dispose of any used and unused formula, and sterilize your equipment. Stylage M w/ Lidocaine is made with sodium hyaluronate, Phosphate buffer (pH 7.2), mannitol, and lidocaine. Unlike other dermal fillers, this treatment gives your patients top quality hydration that lasts up to 1 year with a single injection. This means that your patients will only need to pursue 1-2 sessions a year, depending on how well their skin takes to this treatment, their lifestyle, and the overall condition of their skin. To ensure that this dermal item meets its expected shelf life, store it between 2 and 25 degrees Celsius, and keep it away from direct light, frost, and dampness. This injectable filler has a shelf life of 2 years when unopened. 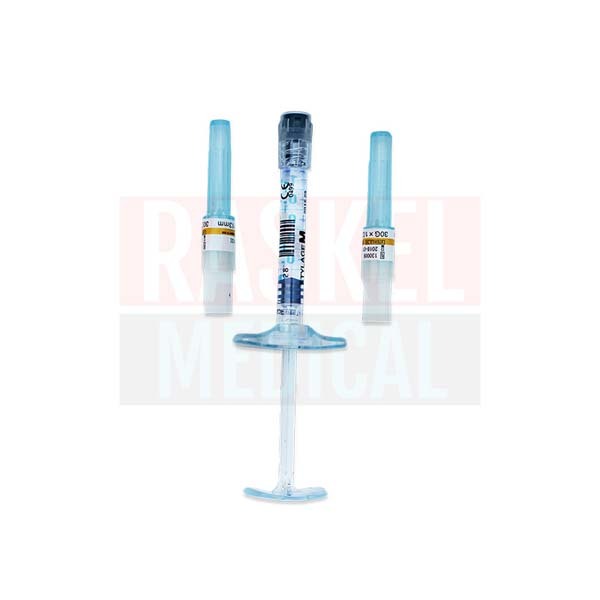 RaskelMedical.com supplies all your cosmetic and medical injectable needs. What’s more, our price matching policy ensures you’ll get the lowest price on your orders. To gain unlimited access to our inventory, all you have to do is create an online account and provide us with proof of your medical license. Once you’ve been approved and your account has been activated, you can order online or give one of our customer service representatives a call to complete your purchase. RaskelMedical.com promises authentic products, with convenient online ordering, to properly assist you with the growth of your clinic.